Home health health news story video THIS MAN WOKE UP WITH A SCAR FROM HIS THROAT TO HIS EARS. HOW IT HAPPENED IS INCREDIBLE! THIS MAN WOKE UP WITH A SCAR FROM HIS THROAT TO HIS EARS. HOW IT HAPPENED IS INCREDIBLE! Stefan Zoleik, a 47-year-old man from Slovakia, will remember the year 2015 for many years to come. Something occurred in June of that year that would change his life for the better. 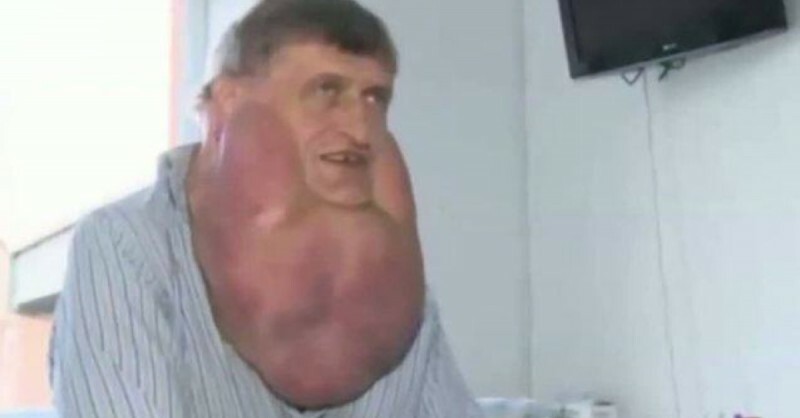 This father of two suffers from a rare condition called Madelung disease. For ten years, a tumor was constantly growing around his throat. Not only did the tumor cause him incredible pain, but he also had to leave his job as a mechanic because of it. Due to the constant teasing he received about his appearance, Stefan became very depressed and started living as a recluse. Doctors refused to treat him due to the risk of dangerous complications, but finally in June 2015, something remarkable happened: a plastic surgeon named Igor Homola decided to try anyway. He scheduled a five-hour surgery to remove the tumor. No one knew if Stefan could survive the operation. The whole surgery team was holding its breath. Thankfully, the procedure seemed to go smoothly. Stefan was barely recognizable in the recovery room. He was stunned when he saw his reflection in the mirror. “I love my new look. I think my face is very attractive!” he said. Additional surgeries are necessary to remove any remaining cells and prevent the tumor from returning, but Stefan is already a different man. “More than anything it was my family who helped me get through this,” he said gratefully.